This 760 Million Parisian-Themed Property is located adjacent to Bally's on the famous Las Vegas Strip, Paris Las Vegas brings the excitement and savior fair of the Ramous French City to the Extertainment Capital of the World. 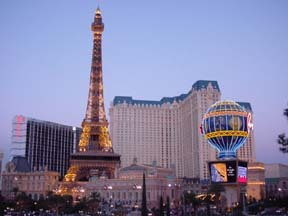 In addition to replicas of Famous Landmarks including a 50 Story Eiffel Tower. The Paris Opera Hours, The Are de Triomphe and The Louvre, Paris Las Vegas houses 85,000 square feet of Casino, 100 Gaming Tables, 2,400 Gamining Machines, and a total of 2,914 Guestrooms. For Breathtaking Views of the Famous Las Vegas Strip, Glass Elevators Glide up the 50-Story Eiffel Tower to an Observation Deck. Standard - 1 King or 2 Queen Beds. Guest roooms feature custom designed furniture crown molding and rich French Fabrics in warm shades of beige. As in France, stately Armoire serves as the closet, enhancing the European fell of the room. Spacious marble bathrooms offer separate bathtub and shower with authentic European fixturesm Linen Land Towel, and large vanity with shelves and Make-Up Mirror. Pay-Per-View Movies, On-Command Video Cable, Television, Tow-Lined Phones, Voice Mail, Hair Dryer, Separate Shower and Bathrub, Iron and Ironing Board, Complimentary In-Room Safes.